Learn the most important vocabulary and start speaking Brazilian Portuguese! Having difficulties getting started with Portuguese? Do you want to learn Portuguese but you don’t know where to start? Getting frustrated because of the lack of simple but effective learning materials? Have you studied for some time but you don’t yet have the vocabulary to hold a decent conversation? Do you feel like learning to speak Portuguese is going to take a lifetime? Can you relate to any of these comments? The good news is that becoming conversational in Portuguese doesn’t have to take a lifetime! In fact, you’ll be able to socialize in Portuguese by knowing only a few hundred words and phrases if you study the right content, the right way! Hi, we are Jan van der Aa and Lucas Bighetti! 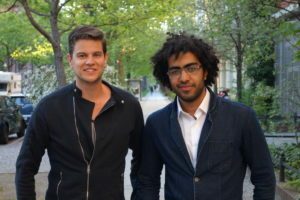 We’re the founders of LanguageBoost, a website where we help people worldwide to learn foreign languages quickly. We are language consultants, coaches, creators of the Language Boo(s)tcamps and authors of the VocaBooster language courses. Of course, we also learn languages ourselves! But something changed, and now we’re able to speak both 10 or more languages. Having studied over 10 languages each in the past decade, we have found that in order to get momentum and to become conversational quickly in another language, learning the most important vocabulary first is crucial. Unfortunately, there were not many resources available for beginners that focus on the right vocabulary and phrases. And that’s why we created VocaBooster Portuguese! With VocaBooster, we teach you the most important vocabulary (and how to use it), so that you can get to a conversational level as soon as possible. Combining the words and sentences from this course will give you the ability to create a huge amount of useful sentences. After helping many people worldwide to get conversational in almost a dozen languages, we’re now proud to announce that VocaBooster Portuguese is finally here! Why can some people pick up Portuguese so quickly? For native English speakers learning Portuguese shouldn’t be too difficult, but still many people fail. How can some foreigners manage to become conversational in only a matter of months? Are they just gifted at languages or to they have a higher IQ? Of course, motivation plays a big role there, but even if you’re very motivated it’s easy to lose your motivation by studying random content that you can’t use in your conversations. So what explains their success? The 80/20 rule (Pareto principle) states that, 80% of our results come from only 20% of our the effort. In other words, by knowing just 20% of the vocabulary and grammar you can say 80% of what you want to say. In English for example, only 1000 words are used in 85% of the times. And if you know 3000 words and you know how you use them, you will be fine in 98% of the situations. We found that what you study and how practice is more important than the number of years you’ve been learning a particular language. How do you find out what your 20% is? If you work as a translator, the word ‘’translator’’ in your target language will obviously be more important for you than for someone else. Everyone’s 20% is different. So how can you find out what your 20% is? Maybe you can look for a frequency list on the internet and add vocabulary that is relevant for you? Frequency lists on the internet are often generated from TV or written content that contain vocabulary not relevant for beginners. Vocabulary is not shown in context. Learning words out of context is the most common mistake in acquiring new vocabulary and makes memorizing new words very difficult. You also don’t learn how the language works. It’s cool to know lots of words but even when you know many words, no one will understand you if you don’t know how to build proper sentences. You don’t learn how to pronounce the language. There are no grammar explanations. In order to memorize new words you need to make as many associations with new words as possible. These lists lack audio and images. With VocaBooster Portuguese you will be able to learn how your target language works, get familiar with the pronunciation and learn highly useful words and phrases. First, read the entire e-book. Discover the similarities between your new language and a language that you already speak. Achieve 100% comprehension of every little detail with the word-by-word translations that we’ve added. We’ve added simple grammar notes to help you understand the structure of the language. You don’t have to memorize anything yet. The most important thing at this stage is to get a feel for the language and to understand how the language works. Now you have an idea of how the language works, it’s time for some serious input. Read the eBook again in small chunks of 20-40 entries each time. Listen to the audio carefully and repeat the keywords out loud, followed by the example sentence. Try to memorize the key word first, later you can also try to memorize the translations of the example sentences. Once you’ve studied the content from the ebook and you’ve listened to the audio over and over again, it’s time to train your output. Read the English words and check if you can remember the equivalent in Portuguese with the correct pronunciation. When you manage to memorize let’s say 50-70% of the vocabulary start from the beginning but try to translate the whole sentence into Portuguese. Doing this on a daily basis for several months will eventually allow you to say the things you want to say, fluently and with confidence. Of course it helps if you use the vocabulary you’ve learned with tutors on a website like italki.com. As a beginner you first discover how the Portuguese language works by decoding the language. Use the word by word translations to get a good understanding of how the language is structured. Listen to the native audio and start to get a feel for how the language sounds. After you have decoded your target language, you can start building your core vocabulary. 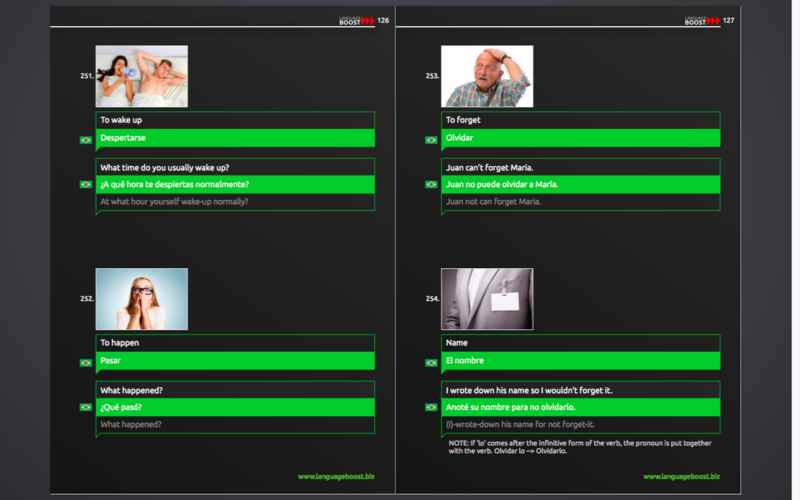 Now you can start practicing your output and build your own new sentences. If you are an intermediate learner, you can use VocaBooster Portuguese to master the foundations and improve your fluency. Make sure you’re using the correct grammar and try to focus on the pronunciation and tones. Test yourself and try to translate the English sentences into Portuguese as soon and as accurately as possible. VocaBooster is the result of years of learning 10+ languages, analysing, translating, worldwide in-field practice, testing, and a lot of passion. It’s a great honor for us to finally share it with the world! When you purchase today, you’ll also join a community of other language learners around the world who you can ask questions to and learn from. But how much does VocaBooster cost? Becoming conversational in Portuguese doesn’t have to costs a fortune. How much is it worth for you to have product that helps you to reach a conversational level in a matter of months? Once you can understand the content by using the transcripts, translations, and word by word translations, it’s time to activate your new vocabulary! If you buy VocaBooster today, you’ll receive an amazing bonus: Ready-made flashcard decks of all the vocabulary contained in the course, compatible with the popular flashcard app: Anki. Our Portuguese Deck includes Native Brazilian Portuguese audio! Practice your output anywhere; on the bus, on the train, or walking down the street – without wasting any time making the flashcards yourself! We learn languages, just like you. We’re certain that VocaBooster will give you everything you need to get started learning a new language. If you put in the work, and for any reason it doesn’t bring you the results you want, we insist you have your money back. Just email us within 30 days of joining, and we’ll send your refund. No questions asked. Isn’t this product very expensive? Learning a language with VocaBooster will give you a head start to fluency. We have spent hundreds (if not thousands) of hours on research – selecting, translating, checking and testing the most useful content. The good news is that all this hard work has made it possible for you to save yourself lots of time and frustration learning vocabulary that is irrelevant for beginners. Decoding your target language and learning the most important vocabulary before taking language classes will allow you to get straight to what you should be doing during your language lessons; speaking practice, and practicing what you’ve already learned. Plus, you don’t need to create your own Anki decks anymore because we’ve already done that for you! Our Anki decks also include native audio. If your time is valuable and you want to be able to speak Portuguese as soon as possible, this will be an investment you won’t regret. Isn’t VocaBooster just a wordlist? No, VocaBooster is much more than that. Although this course is based on the essential vocabulary (80/20 rule), we provide you more than just a word list. All entries come with images, native audio, word by word translations and grammar notes. We also provide flashcard decks so that you can train the content in an interactive way with Anki on your smartphone. VocaBooster provides training materials that will be useful for you for the first 3 months, 6 months or even your first year learning your new language. What does VocaBooster offer that similar products on the market don’t offer? VocaBooster is the only course that focuses on the most important vocabulary, in the right order. VocaBooster comes with simple grammar notes and word by word translations for comprehensible input. Each language family has unique word entries. Revise the content with our Anki decks. Can I become fluent just by using VocaBooster? No. In order to become fluent, studying a language alone is not enough. Eventually you will need need to practice your speaking as well. VocaBooster teaches you the essential vocab you need for your first conversations. If you want to learn how to speak a language we recommend finding a teacher on italki.com after you’ve learned the first 50-100 words and phrases. Also don’t forget to download our eBook full of tips and tricks to help you learn a language more quickly. If you want to practice your speaking with us check out our Bootcamps which we believe are the fastest way to get to a conversational level. Can I get my money back if I don’t find it useful? Yes, if you don’t find this tool useful just let us know within 30 days and we will send you your money back. No questions asked. What is Anki and how can I get it? Click here for a video in which we explain to you in detail what Anki is, how it works and how you can implement our Anki decks in 5 simple steps. How useful is the content? Very useful, we have selected the content for these courses based on a decade of language learning experience and in field practice. We have also used existing word frequency lists to make sure that we haven’t forgotten any important vocabulary. Jan has used VocaBooster to learn Thai and Russian and Lucas has used it for his Ukrainian. We wish we had this when we started learning our first foreign languages. For beginners who want to reach a conversational level asap! 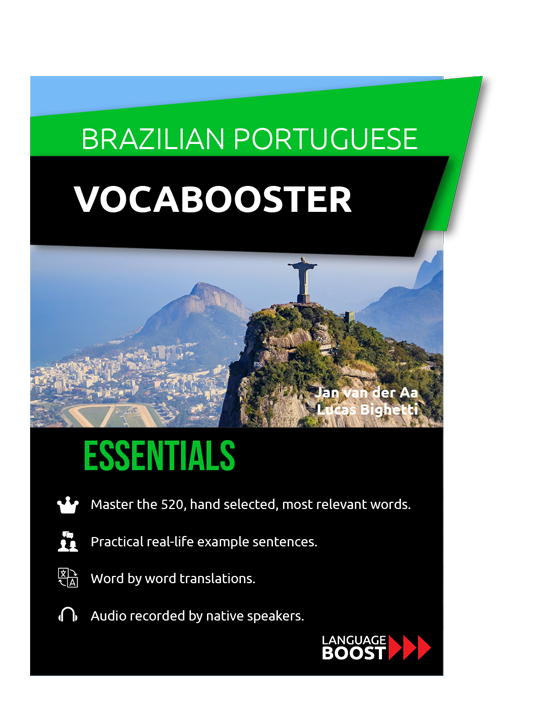 Learning with Vocabooster Portuguese will be the highly effective for those who practice what they’ve learned from the course with native speakers. It can also be a great tool for people in the B-levels who speak the language already. In such cases, this course can help you to perfect your grammar as well as think, translate and speak faster and more fluently. Is French Hard to Learn?